Right off the bat the people behind Roaming Fortress are telling us that this is not just your usual puzzle and strategy game. They are also telling us that there is a great deal of action involved as well. This is great as while I do love a good strategy game sometimes I just wish some of them would put a little more action in them as well. Not only have they made these claims, but Roaming Fortress is also said to be one of the most visually breathtaking games on the iPad. Lets start with the games graphics and they really are quite spectacular. Everything about the game has a high polish look to it. You can clearly tell that a great deal of time, effort and love went into creating this amazing world and its inhabitants. With the fantastic visuals though comes a little bit of a downside. 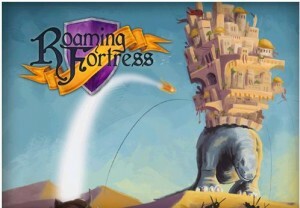 Roaming Fortress is iPad only and not only that it is not compatible with iPad 1. As well as this if you want to get the best visual experience you are going to be needing a 3rd or 4th generation iPad as the game has full retina graphics. Do net get me wrong the game still looks great on a iPad 2 and a iPad Mini, but to really see its beauty you need a retina display. As far as the game play goes it really is a great deal of fun. You play the role of knight from the Manatalopian Knights Army. Do you call even call a group of knights an army? I am not sure , but I will roll with it. Anyway there kingdom was destroyed by a evil Goblin Horde. They eventually managed to gain control over these giant creatures called Burdenbeasts and on the back of these beasts is where would build there new kingdoms and roam the land trying to get back there kingdom from those evil goblins. The story is interesting and so is the game play. I am really not sure what genre you would pigeon hole this game into. Its not really just a strategy game as it has many action elements to it also. You will have different fortress types that you can alter with different combinations of knights to lead into battle. You will need to defeat wave after wave of enemies. It can actually be quite relenting, but it is so much fun that it never feels like it is unfair. In all Roaming Fortress is a great game in both terms of visuals and game play. You can actually download the game and a few levels for free. And if you find that this is the kind of game for you then there are a decent amount of expansion packs offering new challenges for you. In all this is a great game and I am sure that it will be seen as one of the best on the iOS.